My colleagues and I used to pass this place often on the way to lunch at "Japanese Tapas" restaurant Issé, before the latter establishment incomprehensibly doubled their prices and ceded most of the menu to criminally expensive variations on grilled eel. * I'd read Juveniles was an historically important Paris wine bar, but until the other night after a film with my friend F, I'd put off visiting solely on the grounds that no one whose opinions I respect has ever said a peep about the place. It doesn't seem to be on the radar of quality-conscious people. This is understandable, given Juveniles' tourist-artery location, and, yes, the general low quality of what F and I snacked on that night. The wine bar's most notable aspect is in fact that which will prevent me from returning very often, despite its proximity to my office: in its pokey, avuncular décor, its cheesing goofiness towards wine as a subject, and its focus on wine as a global field, through which one may ostensibly travel at the pop of a cork, Juveniles could pass for a genial, amateurish, wine-themed bar in any other city in the world. The wines on offer are similarly global. This style of list, which doesn't seem to have ever really caught on in France at large, to me evinces an understanding of the subject that dates back to a pre-Slow Food era, when the idea of a global society was still alluring, not sinister and homogenizing. I may be reading too far into things. 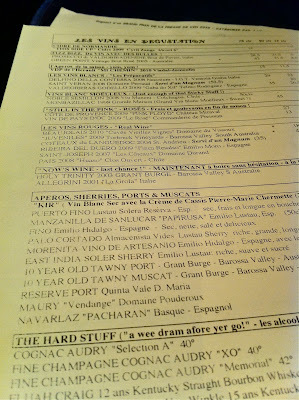 But even on more practical terms I don't see the appeal of drinking a lot of fat over-extracted Chilean or South African or Australian wines - I would say ever, but let us be slightly more politic - while in Paris, where the domestic product is on the whole cheaper, better, more refined, and possessed of greater cultural relevance. They have Pierre et Marie Chermette's tasty but slightly dull old vine Beaujolais by the glass. 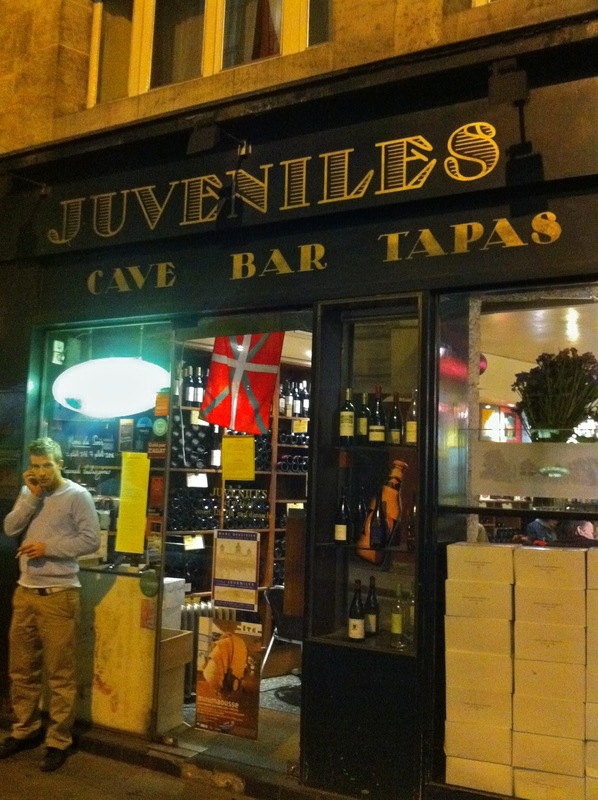 The multi-culti wine list gives rise to the minor irony that Juveniles' location ensures it is the one Paris wine bar many tourists visit, the night before they leave. The English in the dining room was deafening when F and I visited, particularly one trumpet-voiced gay student from LA at the next table who had a great deal to say about everything under the sun. The menu is largely french, with oddball additions like haggis (a reference to owner Tim Johnston's Scottish background). I am usually a very adventurous eater, but will not be returning to sample said haggis, on the basis of a potato side dish I snacked on, which, being composed of potatoes, lardons, and melted raclette, were essentially no-brainer drunk food - the kind of thing you successfully prepare at home while unable to operate appliances - but which was irredeemably and insensibly awful. Like eating shoe-packing. What would a kitchen like this do with a lamb's heart? I shall never find out. Meanwhile, a plate of "assorted cheeses" arrived, containing two cheeses. They were quite good cheeses. But two cheeses is two cheeses, a pair, not an assortment by any stretch of the imagination. At 14€ for the plate, it was the sort of thing to make one regret not being a tourist, shortly to quit the country forever. The insulting cheese plate, however, is intimately connected to what I did love about Juveniles, and what may someday induce another visit: the sherry list. A sherry list! Anyplace with Manzanilla on offer is newsworthy in Paris. But the choice of sherries by the glass at Juveniles was perversely, unbelievably long - evidence of a real love for an unhip, eminently dislikable wine genre. I applaud that so much I can even forgive the first glass I had, which unsurprisingly came from a bottle that had been open rather a long time. F and I later paired some Bodegas Emilo Hidalgo Fino with the rest of the assorted Fourme d'Ambert, and it went down a treat. * Really. My rant on the strange Issé restaurants, and what their success implies about the broader relationship of French people to Japanese culture, is another post entirely. Or a sociological essay.